If even the relatively small miniLDV is too large for your application, MSE’s microV may be the perfect fit. Frequently used with traverses in small places or directly embedded into the hulls of models and full scale vessels, this unique sensor uses holographic beam shaping technology to enable the world’s smallest “time-of-flight” sensor. A “time-of-flight” sensor measures velocity by timing the occurrence of two events. In the case of the microV, these events are the crossing of two distinct miniature laser sheets by a particle. 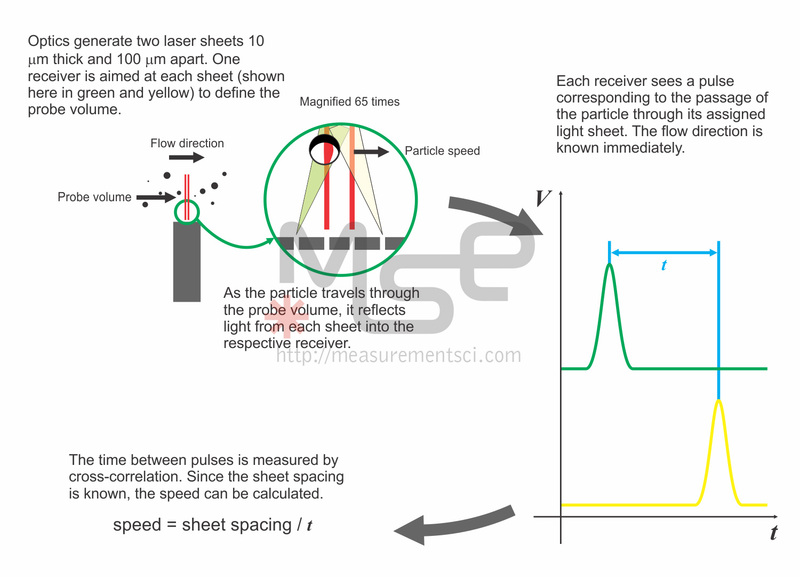 By knowing the spacing between the laser sheets in physical space, the velocity can be calculated by the simple relationship velocity = distance / time. In the microV, the proprietary holographic optic generates two microscopically thin laser sheets a specific distance from the sensor face (see figure). The optic also incorporates two distinct receivers—one for each laser sheet. This allows the distinction of which laser sheet was crossed first, which gives, of course, the direction of flow. 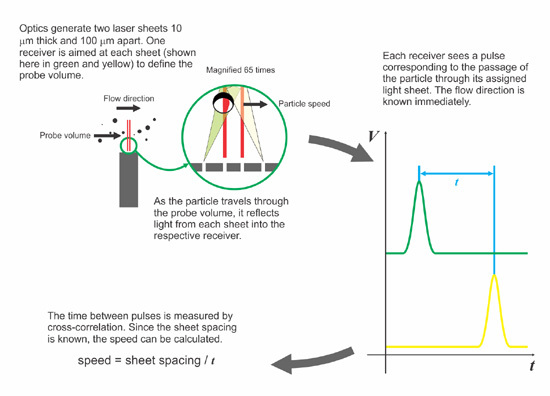 The region of observation of the microV is so small that it is practically impossible for the time of flight measurement to be “confused”—that is, it is virtually impossible for a particle to cross the first laser sheet just before a second, distinct particle crosses the second sheet. Like the microS, the rugged, no-moving-parts design is a benefit when looking for a permanent instrumentation solution or for rugged environments. A great example of this is its use as part of an instrumentation package for an unmanned underwater vehicle.